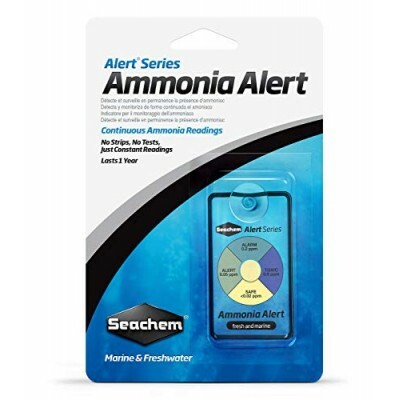 Ammonia Alert is an innovative color device for continuously detecting and monitoring toxic free ammonia. A sensor changes reversibly from yellow to green to blue relative to the ammonia concentration. No test kits chemicals or procedures are needed. The device detects less than 0.05 mgL ppm free ammonia and alerts you to the 1 killer before any sign of stress. It lasts over a year. Marine or freshwater use. In the absence of free ammonia the unit will assume a yellow or faint yellowgreen color. It is normal for the dry sensor to have a greenish hue. It may take up to a few days for a dry sensor to equilibrate with the water. No sampling of water chemicals or test procedures are required. The presence of the free ammonia is detectable continuously with a response time of about 15 minutes. Response to decreasing ammonia is slower requiring about 4 hours to go from TOXIC to SAFE on removal of ammonia.